To Philip Dueñas, thoughts about the Southern Pacific Railroad bring up many fond memories. He remembers where his grandparents and parents lived, the type of work they did and how they lived. His grandparents Felipe Dueñas and Esiquea Guerrero, father and mother of Epifaño Dueñas, hailed from Guanajuato, Mexico, where Epifaño was born in 1903. 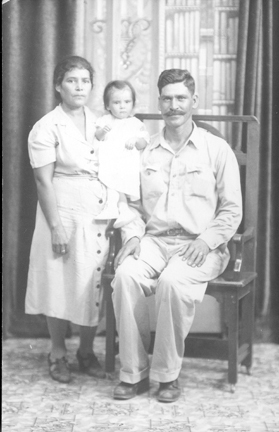 Philip’s maternal grandparents, named Nicholas and Dometila Valero lived in Durango, Mexico, where his mother, Refugia Valerio, was born in 1904. Philip reflects on his life story and tells how his grandfather Felipe Dueñas brought Esiquea and Epifaño, wife and son, to El Paso. Philip says, “My grandpa was working on the railroad … at that time, you could get a pass and … ride free on the train … And he went and got ‘em from Guanajuato.” His father was nine years old. His mother Refugia also came by way of El Paso; she, too, was nine years old. Philip’s parents met in the Marana/Rillito area and married about 1925 when they mostly worked on the farm for her uncle. Philip was born in 1928 on the Drain Family farm located on the east side of Arizona Avenue and Elliott Road of what is today Chandler, called at that time by Mexican settlers, “Chandlercito.” “I guess it belonged to Dr. Chandler,” he said, and added, “…I used to work there as a water boy.” He provided water to workers who harvested sugar beets. Philip had five sisters and three brothers. For most of his childhood, his grandfather and grandmother raised him. 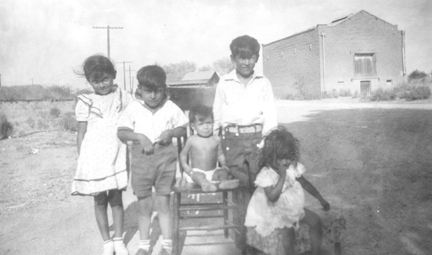 They lived on Hidalgo Street in 1935, an area where residents built or expanded their own homes. The Chandler Improvement Company sold them the lots. He remembers his grandparents’ home, a house made of wood, with dirt floor, and no running water. He hauled the water the cotton gin across the street. Some people used the water from the canal. Kids used canals running through or near residential areas in the valley as swimming pools. Philip’s grandfather enrolled him in the Cleveland School in Chandler, although the majority of Mexican children attended Winn School. He completed junior high and graduated from Chandler High School in 1947. In high school, he played football. On August 12, 1950, Philip married Ruth Mendoza, at St. Mary’s Catholic Church. Ruth was born in Chandler in 1930, and had known Philip since childhood. To support his family, Philip worked for the railroad, off and on, for some time, until Capitol Casting, a foundry in Tempe, hired him, and he worked there between 1960 and 1991 when he retired. Philip and Ruth had three daughters named Ana, Sally, and Katie. They raised a granddaughter, Patsy, whom they consider like a daughter. They had 12 grandchildren. Ruth, a loving mother who raised her family and worked for 12 years as a teacher’s aide and other jobs to help the family, died in 1996 at the age of 65. Philip served on the City Council from 1972-1979. At the age of 84, Philip remembers Chandler through the war years, the Japanese Internment camp and the integration of different ethnic populations within neighborhoods. He witnessed Father Patterson build St. Mary’s Elementary School and Seton High School, and how this improved education for Mexican-American youth in Chandler. He remembers the countless families he has known through the years and how Chandler grew from a small town with 3,000 people by the 1950s to the large, populous city it is today.